An investigator of Thailand's Department of Special Investigation interrogates a key suspect in a human trafficking ring, Samruay Chatkrod, left, in Bangkok, Thailand, Wednesday, July 1, 2015. Just days before the United States is to release its annual global report on human trafficking, Thai authorities announced 72 trafficking suspects already in custody are to be indicted on related charges while warrants have been issued for the arrests of 45 additional people. "We will indict all 72 people who have been arrested,” Wanchai Roujanavong, a spokesman for the attorney general's office, told reporters in Bangkok. “For those people still on the run overseas we will work with national police to send them back, according to extradition treaties," Wanchai said. No bail will be granted to any of those indicted, according to authorities. 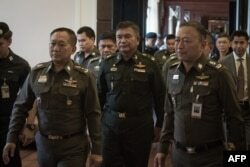 Thai Army Lieutenant General Manas Kongpan, center, is surrounded by police officers as he turns himself in at the police headquarters in Bangkok, June 3, 2015. Among those being held is army Lt. General Manas Kongpan. Thailand's sweeping crackdown in May has also netted 14 other officials, including four police officers in what the deputy national police chief, Aek Angsananont, characterized as Thailand's biggest investigation into human trafficking. “The response from the authorities today is welcomed,” said Matthew Smith, executive director of Fortify Rights, a non-profit human rights organization based in Southeast Asia. Thailand's move against the smuggling networks came after more than two dozen bodies were discovered in jungle graves near sites of suspected people-smuggling camps along the Thai-Malaysian border. The closure of the transit camps, mainly bringing Rohingya Muslims from Myanmar and Bangladesh to Malaysia, compelled smugglers to abandon vessels at sea crammed with thousands of migrants, rather than risk coming ashore. “We will not let influential people rise above justice,” Wanchai declared at a news conference. But human rights activists remain skeptical. “We do have some concerns that some of the senior leaders of these trans-national networks are still operating freely. And in order to really root it out there has to be international cooperation,” Smith in Bangkok told VOA. A year ago, the United States downgraded Thailand to the lowest Tier 3 status in its Trafficking in Persons (TIP) Report but did not, as is custom, enact sanctions against the kingdom, which has been under control of a military junta since a coup 14 months ago. The State Department's 2015 TIP report is to be released Monday. Observers have noted that Manas, alleged to have been a smuggling kingpin, was promoted while Prime Minister Prayuth Chan-ocha was army chief. Prayuth led the May 2014 bloodless coup. Thai authorities, in a country where the military is very powerful and has ousted numerous civilian governments, turned a blind eye for years to the Rohingya smuggling operations. For human trafficking operations to end, Myanmar must take action to stem the exodus of Rohingya, who face systemic persecution in Rakhine state, according to activists. Seventeen countries attended a summit on the humanitarian crisis in Bangkok on May 29. There was no regional agreement, although Indonesia and Malaysia said they would continue to provide temporary assistance and shelter thousands of the irregular migrants if they are resettled or repatriated within one year. Myanmar's attendance at the meeting was conditional on the word “Rohingya” not being used to refer to the people that it considers foreigners from Bangladesh. Its delegates also refused to discuss Myanmar government policies as a significant cause for the migration.